It was revealed today that locally produced thriller Bad Day for the Cut has been included in the New Talent longlist at this year’s British Independent Film Awards (BIFA). BIFA highlights and rewards the best, most innovative and creative independent filmmaking and filmmakers in the UK. 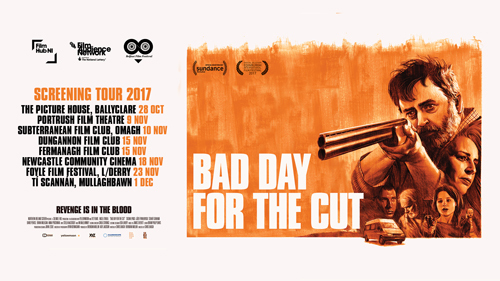 Released by Kaleidoscope Entertainment, gritty revenge drama Bad Day for the Cut is the debut movie by director/writer Chris Baugh and producer/writer Brendan Mullin, a Tyrone pair who run Six Mile Hill Productions. The feature was developed through Northern Ireland Screen’s New Talent Focus Scheme and received lottery funding from The Arts Council of Northern Ireland and the Northern Ireland Screen Fund supported by Invest NI. The film tells the story of a mild-mannered middle-aged Irish farmer, who still lives at home with his mother, who sets off on a mission of revenge when the old lady is murdered. BIFA 2017 nominations will be announced by Maisie Williams and Hayley Squires on Wednesday 1 November. The winners will be unveiled at the ceremony on Sunday 10 December at Old Billingsgate, which will mark the 20th anniversary of the awards.